5 Bedroom Semi Detached House For Sale in London for Asking Price £3,250,000. 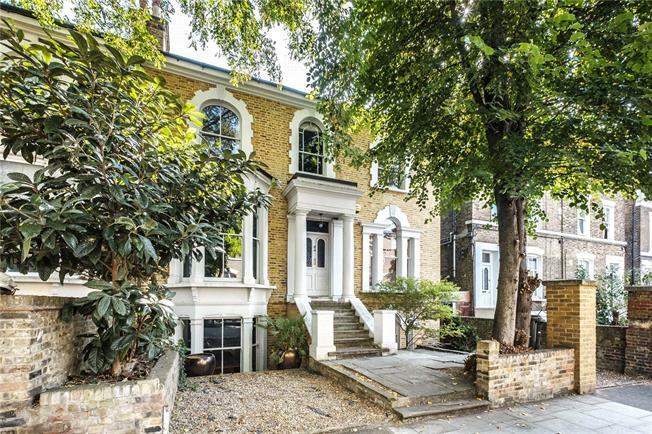 An imposing double fronted period house located on a premium road in Hackney. This lateral semi detached house offers ample space and totals close to 3,000 sq ft. It boasts three floors, five bedrooms, dining room, living room, kitchen diner, study and a close to 60 ft east facing garden. The favourable orientation coupled with the generous bay sash windows mean there is an abundance of natural light throughout. Original features include multiple fire places, stained glass, high ceilings, wooden flooring, sash windows, shutters and detailed cornicing. The property requires some updating but the staples of the space are impressive and it offers any buyer the chance to build their ideal family home. The double fronted and semi detached curb appeal, lateral space and high concentration of period features make this house an extremely rare find. Greenwood Road is a residential street moments away from the open spaces of London Fields and the vibrant Broadway Market together with the London Fields Lido close by. Transport links can be found at London Fields, Hackney Downs (National Rail), Dalston Junction and Hackney Central (London Overground), and numerous bus routes into the West End and City.